A.P. 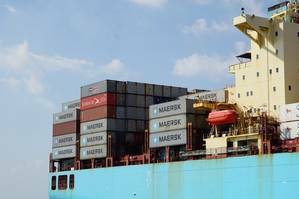 Moller-Maersk will merge Damco Supply Chain Services and Maersk Line's Ocean Product, the Danish shipping giant announced on Wednesday, as it seeks to offer customers the chance to deal with one firm when shipping goods across the world. The operator of Maersk Line, the world's largest container shipping company, kicked off a restructuring drive in 2016 that saw it sell its oil and gas business last year to focus on transport and logistics business. Maersk said its latest change would take effect on January 1, 2019, and be headed by Vincent Clerc, Maersk's chief commercial officer. Damco CEO Klaus Rud Sejling will take on a new position as head of Maersk's logistics and services products, reporting to Clerc, Maersk said. In addition to Maersk Line, Maersk includes port operator APM Terminals, freight forwarder Damco, towage company Svitzer and container manufacturer Maersk Container Industry. After selling its oil and gas business to Total SA, Maersk sold its oil tanker unit. It has also announced plans to list its offshore drilling business in Copenhagen.